Turn your 8 Line style game boards into a skill based bonus feature of our Pushin' prizes coin pushers. Hit the target to activate the Video game to win additional points. 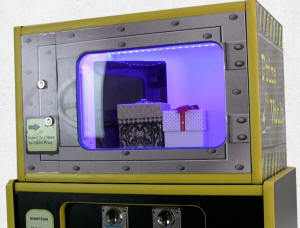 Our Prize Vaults come in single or 5-door configuration and can be used in conjunction with our Coin Pusher, by itself or added to any amusement game. Our eye-catching, color changing LED lighting and colorful graphics is a unique way to grab the attention of any player and change the way redemption is offered. 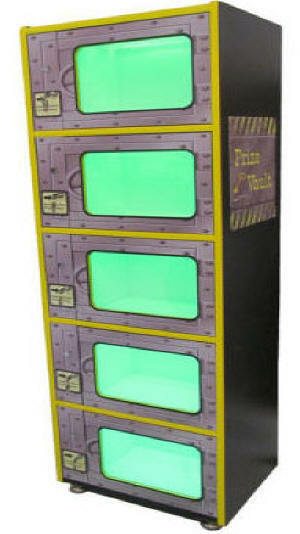 This Prize Vault topper adds another whole new dimension to the game by allowing the operator to use merchandise too large for the playfield. 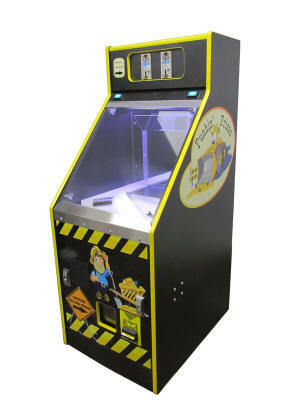 Pushin' Prizes coin pusher |Quarter pusher games. The best the industry has to offer. Its no secret that coin pushers generate big income for a low investment. Operators today are challenged to find new ways to generate income with rapidly changing regulations, a declining economy and just a lack of available, reliable and proven earning equipment on the market. Pushin' Prizes is a Coin Pusher that has been constructed with two key factors in mind - Quality and Reliability resulting in Profitability. Quality –Our Coin Pushers are made with superior parts, materials, and manufacturing techniques and weighs 350 pounds which results in the elimination of vibration on the play field and prevents shaking and break-ins. Reliability – Our Coin Pushers reduce the need for service and repair. Each machine is manufactured in the U.S. We offer a 12-month manufacturer’s warranty on parts. 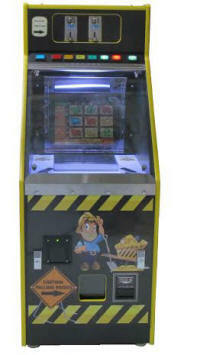 Our coin pusher can be operated in a variety of ways. This includes the traditional coin-in/coin-out or token-in/token-out. We can also add a ticket dispense, thermal printer or debit card reader. We also offer a Prize Vault which is a locker that can be opened with a key where a prize is stored – Unlock the door and claim your prize. Our unique locking mechanism retains the key.